With the signing earlier today of former Chicago Blackhawks forward Nick Schmaltz to a seven-year, $40.95MM contract extension, The Athletic’s Scott Powers (subscription required) wonders what kind of extensions might forwards Alex DeBrincat and Dylan Strome earn, as both will be eligible to sign new deals on July 1. DeBrincat, who is in the second year of his three-year, entry-level contract, has already tallied 68 goals in two years, including a 40-goal campaign this season. With those numbers, Powers writes that the Blackhawks are most likely going to get DeBrincat to eventually sign a six-year deal, likely heading into the $8MM AAV-range, pointing out that a seven or eight-year deal is unlikely since a six-year deal will leave him looking for a third contract at age 27, the perfect age for a long-term extension. If he can continue posting 30-to-40 goal seasons, DeBrincat could be in line for double digit cap hits in the future. As for Strome, the team may be better off waiting for another year to lock up the young forward. Strome has played well in Chicago with 14 goals and 45 points in 53 games, but both sides would be better off to wait another year for more proof that he deserves a big contract extension. Plus, it would be wise if Chicago doesn’t have two big contracts handed out in the same year, which could get expensive, possibly between $13-15MM combined. The Athletic’s Adam Vingan reports that the Nashville Predators have activated defenseman Dan Hamhuis from injured reserve. The veteran blue liner has been out with a leg injury since February 23rd, but it finally ready to return. The team’s third-pair defender has played 53 games this season for the Predators and will now partner up with rookie Dante Fabbro, who is expected to make his debut Saturday against Columbus. The Predators also announced they have assigned Troy Grosenick to the Milwaukee Admirals of the AHL. SportsDay’s Matthew DeFranks reports that the Dallas Stars will be without goaltender Ben Bishop on Saturday and likely longer, as he is considered to be day-to-day. The 32-year-old Bishop has been a key reason why Dallas has been playing so well as they fight to hold onto their wildcard spot. 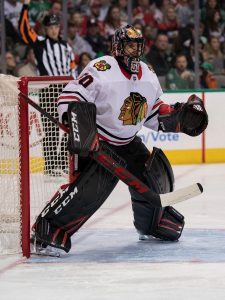 Bishop has a 2.03 GAA and a .933 save percentage so far this year and may even be a Vezina Trophy finalist at this rate. NHL.com’s Mike Heika writes that he suffered a lower-body injury while going down into the butterfly in the Stars’ last game. DeFranks also adds that Mats Zuccarello and Justin Dowling are about three days away from returning to the lineup. The Athletic’s Michael Russo (subscription required) writes that the Minnesota Wild are expected to be one of the most active teams in trying to sign St. Cloud State defenseman Jimmy Schuldt in the next few days. Schuldt finished his four-year college career Friday night, posting 38 career goals. Russo reports that the Wild hope to sign the four-year blue liner by burning the first year of his deal this season and allowing him to play in the NHL for the team’s final few games. The Chicago Blackhawks have come a long way over the last few years as the franchise has been forced to look for ways to develop young talent as their NHL club sits overloaded in bloated, unmovable contracts. Regardless, the team has done a solid job of integrating talent, including several key additions last year, most especially from Alex DeBrincat and the team was rewarded with a 28 goal season. With the team’s development camp completed, The Athletic’s Scott Powers (subscription required) ranks all 59 of Chicago’s prospects, which he defines as players who have played less than 82 NHL games and haven’t clinched a full-time role with the team yet. One area the team has focused on has been signing collegiate undrafted free agents and Powers’ top prospect is Northeastern University signee Dylan Sikura, who signed with the team on March 25. 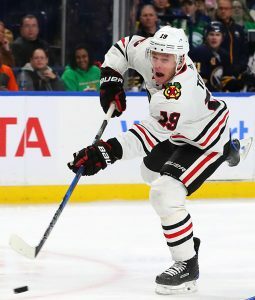 The 23-year-old winger completed four years at Northeastern, posting 43 goals in the final two seasons and added three assists in five late-season games with the Blackhawks. The scribe expects Sikura to establish himself immediately in the team’s top-six and be a permanent fixture for a long time. After undergoing two hip surgeries a year ago, veteran forward Ryan Callahan has been a key player for the Tampa Bay Lightning this season. While his defensive skills and penalty killing have been critical for the Lightning, he also contributed a goal and an assist Saturday in Game 5 of the Eastern Conference Finals. What’s amazing, writes The Athletic’s Joe Smith (subscription required), is that Callahan admits that he thought he would need season-ending surgery back in December when he suffered a serious shoulder injury. The 33-year-old collided with Arizona’s Oliver Ekman-Larsson in a Dec. 14 against the Arizona Coyotes in which the two players got tangled and Callahan’s shoulder vaulted into the boards. He lost three weeks of his season, rehabbing the injury, but returned in early January. Despite re-injuring the shoulder in March, he has not let up and continues to throw his body around for the Lightning in the playoffs. Stu Cowan of the Montreal Gazette writes that Montreal Canadiens scout Sean Burke, who served as co-general manager with Martin Brodeur, for Team Canada at the IIHF World Championships this week, has no idea what his next step will be. Burke, who has served as a scout for Canadiens’ head coach Marc Bergevin, said he might like to return as a scout, but will wait to see if he gets a better offer. “(Marc) Bergevin has been great with me in allowing me to do both roles and gain experience here as well. So we’ll see what’s down the road, but like everybody in this business you’re looking to get better and I’ve been fortunate to work with great people,” Burke said. In his most recent podcast, TSN’s Bob McKenzie talks about Florida Panthers prospect Adam Mascherin, who says he will not sign with the team and has indicated he wants to re-enter the 2018 draft. The Panthers’ 2016 second-round pick claims to have been treated poorly by the Panthers and claims to not have been offered an entry-level deal. McKenzie says the Panthers have offered him an entry-level deal, a lucrative one that compares to that of the one that the Chicago Blackhawks’ Alex DeBrincat signed. He chose not to sign, because he “wasn’t feeling the love.” McKenzie adds that Mascherin is playing a dangerous game if he re-enters the draft as most players who re-enter get drafted lower and get lesser contracts. 2017-18 wasn’t a success for the Chicago Blackhawks. For a team that registered 109 points in the previous season, anything short of Stanley Cup contention would seem disappointing. Disappointment may have been the nicest way of expressing how fans felt after the season began and the team immediately, obviously, wasn’t the same beast that had finished first in the Western Conference in 2016-17. 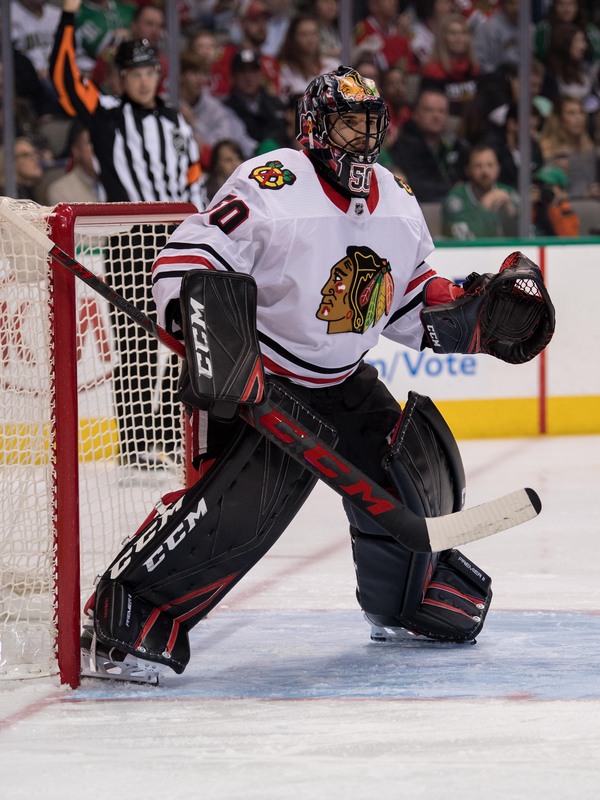 Maybe that should have been expected after an offseason saw incredible turnover to the roster, with Artemi Panarin, Marian Hossa, Niklas Hjalmarsson, Trevor van Riemsdyk, Brian Campbell, Marcus Kruger, Scott Darling and several others fail to return for a variety of reasons. But, with familiar faces like Brandon Saad and Patrick Sharp back in town, there was hope that they could maintain their Stanley Cup window. It wasn’t to be, as Chicago recorded just 76 points and failed to even be in the playoff race for much of the season. Saad failed to record 20 goals, Jonathan Toews registered the worst offensive season of his career, and Corey Crawford struggled through injury. 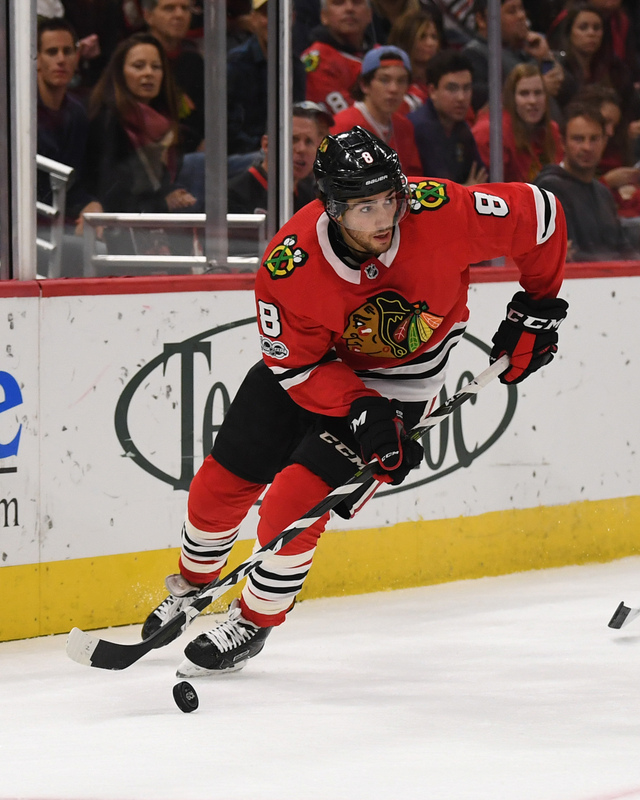 But, with all of those negatives sticking out there may be some who have overlooked the positives from this season’s edition of the Chicago Blackhawks. Alex DeBrincat burst onto the scene with 28 goals an 52 points as a rookie, just a year after he was cut from the US World Junior team. His knack for finding open ice didn’t disappear at the NHL level, and the 20-year old winger looks like he should have several 30-goal seasons in his career. Jordan Oesterle went from NHL cast-off to 20-minute defenseman overnight, and looks like a legitimate top-4 player for the coming years. He’ll cost the Blackhawks just $650K next season, an incredible value for a player that they’ll rely on heavily. That brings us to Nick Schmaltz, who proved he could be an offensive contributor in the NHL with 52 points, and is the key to much of the Blackhawks success going forward. Players like Schmaltz, who were selected relatively high by Chicago in recent years, must start paying off if they’re to get back to their championship level. Toews, Kane, Brent Seabrook and Duncan Keith aren’t getting any younger, and their contracts will continue to be tough to build around. There aren’t any free agent saviors coming to Chicago without further complicating their salary structure, perhaps to the point where it is untenable. No, the team must find success through internal development, and it looks like that is starting to happen. The team traded Ryan Hartman, their top pick from 2013, for another first-round selection this season and prospect Victor Ejdsell. That likely won’t be happening with Schmaltz (the top selection from 2014) or DeBrincat (2016), or with Henri Jokiharju (2017) who could be a key to the whole thing. Jokiharju has developed wonderfully so far in the WHL, where he recorded 71 points in 63 games this year for the Portland Winterhawks and could be a real difference-maker on the NHL blue line in short order. Chicago holds eight picks in this year’s draft, and they must use them to bring more talent into the system. The only way Toews, Kane and others get back to the level of success they’re used to, is if internal options take another step forward. USA Hockey announced their initial 2018 national roster for the upcoming 2018 IIHF Men’s World Championships on May 4-20 in Copenhagen and Herning, Denmark, headlined by Chicago Blackhawks star Patrick Kane. 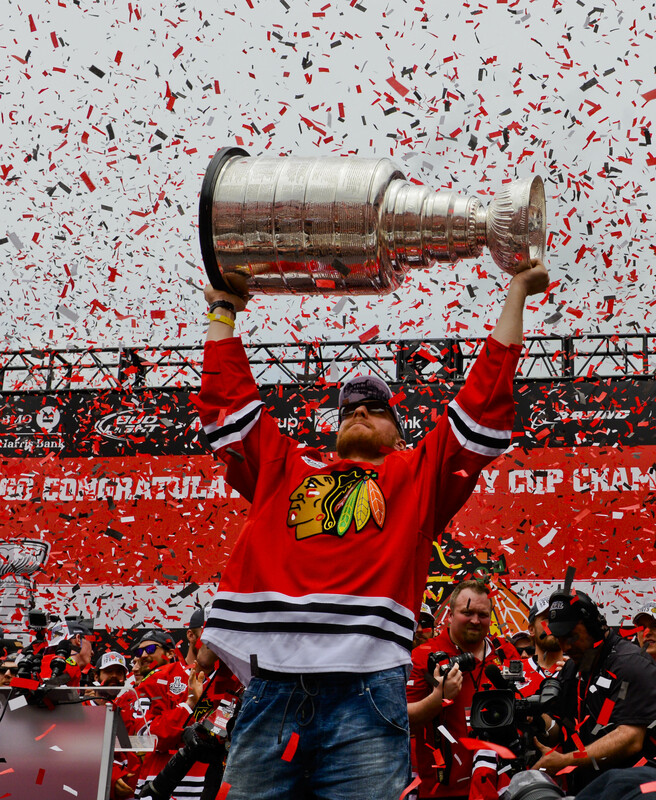 Kane, who announced he’d play this summer after his Blackhawks season ended with no trip to the playoffs, represented the U.S. twice in both the 2010 and 2014 Olympic Games, leading the U.S. to a silver medal in 2010, was named the captain of this team back on April 9. He will be joined by four others with World Championship experience, including Detroit Red Wings forward Dylan Larkin, New York Islanders forward Anders Lee, Chicago Blackhawks defenseman Connor Murphy and the Calgary Flames forward Johnny Gaudreau. The NHL released the names of the 2018 Calder Trophy nominees as the New York Islanders’ Mathew Barzal, Vancouver Canucks’ Brock Boeser and the Arizona Coyotes’ Clayton Keller were named as the league’s top rookies. The award will be voted on by the Professional Hockey Writers Association with the winners to be announced on June 20 in Las Vegas. In a year in which there were a large amount of talented rookies, several good players didn’t get nominated, including the Tampa Bay Lightning’s Yanni Gourde, Boston Bruins’ Charlie McAvoy, New Jersey Devils’ Nico Hischier, Chicago Blackhawks’ Alex DeBrincat and Winnipeg Jets’ Kyle Connor. Barzal is the likely hands down winner after putting up a great rookie year with 22 goals and 83 points, centering the Islanders’ second line for most of the season. He was the only rookie to average more than a point per game (1.04) and had three five-point performances throughout the season. His emergence could lessen the blow if teammate John Tavares opts to leave via free agency as Barzal could easily take over as the team’s franchise player. Boeser’s chances are slimmer after only playing in 62 games when he was lost for the season with a back injury. However, in that time, he put up 29 goals, 55 points and was named MVP of the 2018 All-Star Game. He should be a constant presence along with Bo Horvat with the young core of forwards that are coming in as the team’s rebuilding project begins to come to fruition. Keller led all rookies in ice time (18:05) and put up 23 goals and 42 assists in his freshman campaign and also led the team in goals, assists and points. He provides the franchise with another core piece as the Coyotes begin to build their team back to contending status. NBC Sports’ Sean Leahy was the first to report the news. The Tomas Tatar trade seems so far to be a big win for the Detroit Red Wings writes the Detroit Free Press’ Helene St. James. Dealt at the deadline for Vegas’ 2018 1st rounder, a 2019 second rounder and a 2021 third rounder, Tatar is a healthy scratch for the Golden Knights as they made quick work of Los Angeles. St. James believes Tatar will see time again in the playoffs, but she cites this trade as one in a series where the Red Wings got the better of another team. St. James points out that the Brendan Smith trade a year prior with the Rangers is now considered a heist with the Wings picking up a 2017 third round pick, and Ottawa’s 2018 second round pick, which will be the 33rd overall pick. Smith, meanwhile, had a tumultuous season with the Blueshirts that saw healthy scratches, a demotion, and a fight in practice–all of this occurring after signing a four-year, $17.4MM deal. Petr Mrazek was flipped for a conditional 2018 fourth round pick that is now a third rounder along with a conditional 2019 third round pick should Mrazek re-sign with the Flyers. Not a bad haul for players who haven’t really lived up to their end of the bargain for their new teams. The Athletic’s Scott Powers reviews Blackhawks rookie Alex DeBrincat’s season, and the marks are unsurprisingly positive. Powers writes (subscription required) that the Hawks’s first year forward was hoping to just make it out of camp with the team, but 52 points (28 of them coming as goals) was certainly more than anyone could have envisioned. The future is bright for a Hawks squad that missed the playoffs and saw a lot go wrong this season. DeBrincat’s performance is a silver lining, Powers reports, and the 20-year-old had one of the best rookie performances in Blackhawks history. Powers adds that the goal totals could be higher next season should DeBrincat see more time on the powerplay. Last season, he logged the sixth most minutes when the Hawks were on the man advantage, a metric that should certainly rise given his propensity to find the back of the net. The USA Today’s Kevin Allen gives five reasons why the Vegas Golden Knights are suddenly one of the trendy picks to win the Stanley Cup in their first season. A raucous home ice advantage is one of the reasons Allen believes the Golden Knights are finding success. But Allen cites the chip on the shoulders of players and staff who were spurned by a previous organization as one of the main reasons for Vegas’ success. Allen writes that such an attitude gave the players a “passion and purpose” and has carried onto the playoffs, making the Golden Knights a dangerous opponent.